Coastal Mississippi’s history began with the Gulf of Mexico. Early explorers, Native Americans, and immigrant fishermen started our seafaring culture. Today, the coastal waterways including the gulf, Intercoastal Waterway (ICW) and Pearl River are used by work boats, commercial fishermen, and recreational boaters. Mississippi’s inland waterways are also popular with recreational boaters. 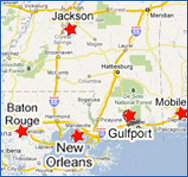 Fort Bayou, Sand Island, Pine Island, and the Pascagoula River are popular with recreational boaters. Mississippi enjoys an extended boating season due to our warm climate. Mississippi’s boating under the influence (BUI) law was enacted in 1995 when federal regulations first required a PFD (life jacket) for everyone aboard. BUI laws have evolved out of our driving under the influence (DUI) law but there are important differences. Mississippi’s BUI law applies only to operation of a watercraft with an engine of 25 horsepower or more, plus all personal watercraft, meaning PWC or jet skis. Operation of a watercraft means the watercraft is under power. This does not include watercraft at anchor or under sail power. Unlike a DUI stop, no reasonable suspicion is required to justify a boating stop and inspection. This means it is easier to get stopped operating a boat than driving a car because marine patrol is authorized to stop and board your boat for any reason. Typically, a vessel safety inspection begins by boarding your boat. Marine patrol will verify boat ownership (whether registered or documented), boaters license, safety equipment, safe load, fishing license and legal catch. The inspection will also note whether the operator appears safe and sober. If the operator has had a few beers, marine patrol is authorized to investigate for BUI. Possession of alcohol and responsible drinking is legal in Mississippi’s coastal counties. However, marine patrol is authorized to investigate whether the operator is under the influence and to search the vessel for marijuana or illegal drugs. Marine patrol may conduct the same Standardized Field Sobriety Tests (SFST) used in DUI investigations. Nevertheless, performing field sobriety tests on a rocking boat in close quarters may be impractical, appearing more like “stupid human tricks” than a criminal investigation. An experienced BUI attorney will know how to leverage this to the advantage of the defense. BUI enforcement is primarily the responsibility of the Mississippi Department of Wildlife Fisheries and Parks (MDWFP). However, any state law enforcement agency is authorized to arrest for BUI. This means that the Department of Marine Resources (DMR), Sheriffs of Jackson, Harrison, and Hancock Counties and the coastal cities can make BUI arrests. BUI investigations can originate with random safety checks. Sometimes the MDWFP or DMR enforcement will respond to cell phones and radio calls from concerned citizens reporting reckless operation or disregard of no wake zones and navigation rules. During the warm months, MDWFP monitors recreational fishing limits at the boat ramps. If those agents are not sworn law enforcement agents, they can call local law enforcement to investigate BUI. MDWFP also enforces BUI on the inland lakes located in dry counties. Sometimes local police departments are waiting at the boat ramp when you return. The Coast Guard is now a branch of Homeland Security. It is the lead federal law enforcement for maritime drug interdiction and boater rescue. Coast Guard Station Gulfport harbors several vessels while Coast Guard Air Station New Orleans provides helicopter support for interdiction and rescue. According to the Coast Guard, a boater is more likely to become impaired than a motorist for the same amount of alcohol. In fact, the Coast Guard reports that alcohol is involved in a third of all boating fatalities. For this reason, vessel safety checks are a routine part of the Coast Guard’s mission. Coast Guard BUI investigations may utilize the Alco-Sensor for breath alcohol testing. The Gulf Islands National Seashore is routinely patrolled by the National Park Service (NPS). Park Rangers, the U.S. Fish and Wildlife Service (FWS), and the Coast Guard have marine patrols whose mission is law enforcement and boater assistance. A NPS ranger lives on Horn Island. Ship Island is patrolled by NPS. During the summer months, Ship Island also hosts a Harrison County Sheriff’s deputy in addition to the county marine patrol. BUI charges filed by the NPS, FWS, or Coast Guard can go to trial in federal court which convenes in the Dan Russell, Jr., United States Courthouse in Gulfport. A federal BUI charge is a class A misdemeanor and carries a fine of up to $5,000. Federal prosecutors can also charge BUI using Mississippi law pursuant to the Assimilative Crimes Act but those charges will be filed in federal court. he has an alcohol concentration of eight one-hundredths percent (.08%) or more based on a chemical analysis of breath, blood, or urine. This is the same per se rule that applies to DUI. Evidential breath tests are conducted on the Intoxilyzer 8000, just like in DUI cases. Unlike DUI, the test must be given within 3 hours of the stop. Mississippi state and federal courts also recognize the synergistic or combination effect of alcohol with controlled substances such as marijuana and other drugs. BUI first offense is punished by a fine, possible jail time, and completing the MDWFP boating safety course. BUI second offense in five years is punished by a fine, mandatory jail time, community service, and a ban on watercraft operation for one year. BUI third offense in 5 years is punished by a fine, mandatory jail time, and a ban on watercraft operation for two years. BUI fourth offense in 5 years is a felony, carries a hefty fine, mandatory prison time, and a three year ban on watercraft operation. Aggravated BUI causing death or serious injury is a felony and is punished by a lengthy prison term. The consequences of a BUI charge may reach far beyond your time on the water. For example, employment, professional licenses, or security clearance may be affected. There are many important differences between DUI and BUI. Regardless whether you have a Merchant Mariner Credential, Master’s License, or you are a recreational boater, call us today. You have defenses. Even if you think you are guilty, non-adjudication may be an option to keep your record clean. Call the Law office of Rufus Alldredge at 228.863.0123. We are located at 1921 22nd Avenue, Gulfport, Mississippi, close to the federal and state courthouses.